Three Terriers will spend the next two weeks competing at the 2019 IIHF World Junior Championships in Victoria, British Columbia. Sophomore Logan Cockerill and freshman Joel Farabee earned spots on the final U.S. roster while Shane Bowers will skate for Team Canada. Farabee registered a pair of assists in a 3-2 exhibition game win against Russia. Team USA begins preliminary round play on Wednesday, taking on Slovakia in a 6:30 p.m. ET start. Bowers scored a goal in Canada’s 6-1 exhibition win over Slovakia, batting a puck out of the air past the Slovak goalie. Defending champion Canada’s first preliminary round game is against Denmark on Wednesday at 8:00 p.m. ET. NHL Network and TSN will broadcast the tournament games (with some delayed). ►Junior co-captain Dante Fabbro will also be in action over the holidays as a member of Canada’s Spengler Cup squad. The tournament begins Wednesday in Davos, Switzerland. Fabbro, who won a gold medal at last year’s World Junior Championships and a silver at the 2017 WJCs, is one of two NCAA players who will suit up for Canada. Last winter, BU captain Brandon Hickey played for Canada’s Spengler Cup champions. ►Freshman forward Jake Wise will miss the remainder of the season due to an injury. A third-round draft pick of the Chicago Blackhawks in 2018, Wise had two assists in 12 games and last played in the scoreless tie against BC on Dec. 1. ►Terriers will add goalie Vinnie Purpura to the roster beginning with second semester. The 6’3” native of Lemont, Illinois, had originally been scheduled to arrive next September (THFB report). Purpura had a 2.40 GAA and a .916 save percentage for USHL Omaha in 2017-18. This season he had a 3.71 GAA in eight games for Omaha before being traded to Youngstown, where he had a 1.97 GAA and a .912 save percentage. The North Barrington, Ill., native is extremely small, but has exceptional vision. He moves the puck north effectively, both with his feet and by passing it. He was really fun to watch. Hutson also excelled at the World Selects Invitationals in 2016 and 2018, earning top defenseman honors in 2016. In his first season with Honeybaked, Hutson was coached by his father, Rob, an NHL scout for the Coyotes who played NCAA D1 hockey for the University of Illinois-Chicago Circle in the early 90s. Boston University picks up a commitment from ‘04 LD Lane Hutson of Honeybaked. From Illinois, Hutson is a small puck-mover with great vision and feet. PP specialist. Excelled at this past summer’s STX 68 Combine. 4.25 ⭐️ prospect Lane Hutson commits to BU. Small, quick, shifty, high speed and pace prospect with high hockey IQ and vision. Undersized D, explosive skater, effortless puck handler and playmaker. Earned A+ at HPHL U14 report and A at STX 68. Bob Crocker, a former Terrier skater and an assistant coach under Jack Kelley and one of the really good guys in the hockey community, died Friday night at 92. His passing resulted in an outpouring of tributes and praise for the “Dean of New England Scouts” from all corners of the hockey world. Bob Crocker, the 'Dean of New England Scouts,' died last night on the Cape at 92. A long-time scout with the NYR & LA Kings, he was also Hartford Whalers asst. GM, head coach at Penn, and asst. at BU. Bob was loved and respected by all. A good life, filled w/ kindness & friends. As Kelley’s assistant for ten seasons, Crocker helped him build four NCAA tournament teams and BU's first two national championship squads. A Navy veteran, he also coached baseball at BU. After BU, he was head coach at Pennsylvania, then assistant GM of the Whalers before beginning a long career as an amateur scout for several NHL teams, working through last season. Virtually everyone in hockey know him. Was glad to call him a friend. The Terrier Hockey Fan Blog wrote about Coach Crocker several times: In 2015 he received the Lester Patrick Trophy for outstanding service to hockey in the United States. He was honored by BU during a BU-BC game in 2007. 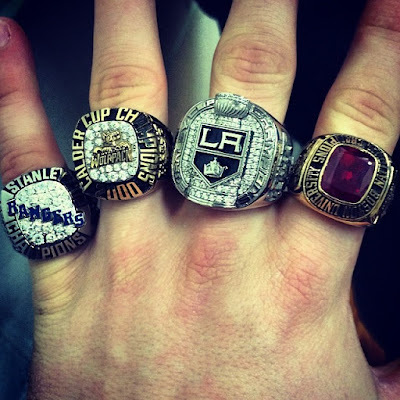 His championship ring collection was featured in this post. ►Former Terriers Jack Eichel, Matt Grzelcyk and Charlie McAvoy are teaming up to raise funds for the Travis Roy Foundation. Join Charlie McAvoy, Matt Grzelcyk, and Jack Eichel in raising money for the @TRFoundation. Purchase a raffle ticket for your chance to win a VIP package, including premium tickets to the Bruins vs. Sabres game on 1/5. When the Sabres defeated the Bruins at TD Garden on December 16, it was reportedly the first time five former Terriers played in a single NHL game with Evan Rodrigues and Jakob Forsbacka Karlsson joining Eichel, Grzelcyk and McAvoy. Eichel led the Sabres to a win with two goals and two assists while JFK had an assist for the Bruins. I hope you continue to have such quality information to share with everyone! For cricket world cup 2019 captains, click here! I hope you continue to have such quality information to share with everyone! For ICC Cricket World Cup 2019 Schedule, click here!